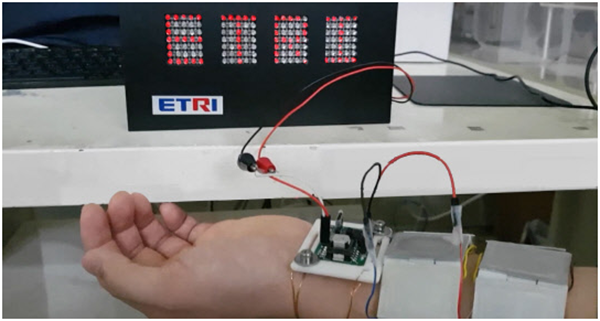 A team of researchers from the Electronics and Telecommunications Research Institute (ETRI) in Kwangju, South Korea developed a thermoelectric module that converts body heat into electricity and amplifies it to power wearable devices. According to a press release from ETRI, the module is 5 cm wide and 11 cm long and includes a patch that is attached to the skin. The temperature difference that produces the thermoelectric effect is between the skin and the module. Researchers claim that the device’s power management circuit technology keeps energy conversion above 80 percent efficiency even at low voltages. They were able to produce 35 microwatts of output, which is 15 more than the highest total produce by researchers in the U.S. Coupling six of the devices together enabled continuous electricity conversion up to 2-3 mW. To demonstrate the success of the devices, researchers lit up an LED display board featuring the institute’s acronym. More study is ongoing to combine the power management circuits into a single chip to improve comfort for the user. Commercialization is expected within two to three years.